Barracuda Backup makes it easier and more cost-effective than ever for you to protect all your data from cybercriminals, natural disasters, hardware failures, and more. Physical, virtual, cloud, and SaaS a single, integrated solution keeps all your data safe. Includes: Barracuda Backup Server 290 / Barracuda Backup Server 190 1 Year EU+IR / Barracuda Backup Server 190 1 Year Unlimited Cloud Storage ONLY WHILE STOCKS LAST! Barracuda’s got you covered for security and data protection, but protecting against exfiltration and theft of data shouldn’t be overlooked. Barracuda Encrypted Backup ships with encrypted disk drives which render data useless when removed from the appliance. When coupled with a power-on password for the appliance, this prevents sensitive and critical data from falling into the wrong hands if disk drives or appliances are lost or stolen. 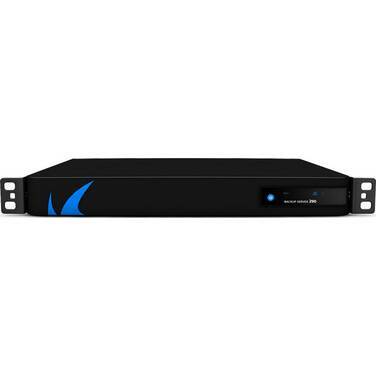 Barracuda Encrypted Backup appliances use disk drives with native encryption, avoiding the significant performance and efficiency degradation that software-based encryption solutions suffer. Barracuda inline deduplication, an inherent capability of all Barracuda Backup products, lets organizations significantly reduce storage needs, bandwidth requirements, and backup costs. By deduplicating data as it is received, Barracuda Backup minimizes the time for completion of the full backup and replication process. Barracuda’s advanced variable block deduplication analyzes the data type and chunk size, setting a block size to obtain the greatest level of deduplication. For organizations protecting multiple sites, Barracuda’s global deduplication and cloud storage technology help distributed networks stay protected while reducing the backup storage footprint. Barracuda Backup lets you protect against local disasters and data loss by using the cloud to simply and cost-effectively get data off-site. It lets you securely and efficiently replicate data to the Barracuda Cloud, a remote physical backup appliance, a remote virtual backup appliance, or Amazon Web Services (AWS) for off-site protection. 256-bit AES encryption of all data in transit and at rest ensures security. Barracuda offers a wide range of restore options: Organizations with physical servers are able to perform bare metal restores in case of catastrophic failure, while virtual environments benefit from fast image-based restores. For customers with Instant Replacement: In the event of a complete site disaster, Barracuda will preload the most recent data and configuration settings stored in Barracuda Cloud Storage onto the replacement unit for emergency restores. In the event of a complete site disaster, Barracuda will preload the most recent data and configuration settings stored in Barracuda Cloud Storage onto a replacement unit for emergency restores. The replacement will be shipped the next business day after the preload is completed. Organizations can also leverage Cloud LiveBoot for offsite disaster recovery. As an added benefit, subscribers receive a free hardware refresh to the latest model every four years. Barracuda’s robust central management allows organizations to manage multiple sites from a clean and simple-to-use interface. Administrators can define roles in their organization for access to each location.